As a local business owner, you know that “word of mouth” is easily the most effective and important way to market your business. Indeed, especially when it comes to local business, word of mouth is a very common and crucial means of attracting customers to your door. Your prospective customers will look to their friends and acquaintances to find and learn more about your business. Your prospects rely on such information because frankly they don’t know anything about you or your business. You have to put yourself in your customers’ shoes and understand that they are taking a bit of a risk when they decide to use your services or products. After all, they don’t know if your services or products are just plain bad, if they can trust you, etc. Your prospects need some proof to assure them that they should go to your business and use your services or products. Thus, just like any other human being, your prospects will turn to those people in their network for recommendations. We all use what is called social proof to help us make decisions. We rely on what others say and do around us to help us figure out what to do. For instance, if you were walking on a busy sidewalk and everybody suddenly started staring at the sky, you’d likely look up too to see what’s going on. The same idea goes for your business. If one of you prospect’s friends and acquaintances began visiting your business regularly, chances are that this prospect would do the same. Now how does word of mouth have anything to do with the internet? 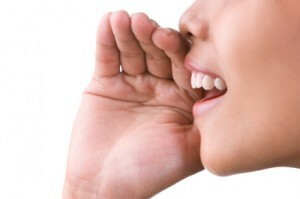 Well, it turns out that word of mouth has a lot to do with the internet and increasingly so. For instance, when I moved to New York City about a year ago, I had absolutely no idea which places in my neighborhood would be good for something to eat. However, I quickly went on Yelp to look at reviews of some of the places in my local area. In less than 10 minutes I was already compiling a list of places I wanted to check out based off of user reviews. Such an anecdote is not uncommon. Increasingly your prospective customers are turning to second-hand reviews on sites like Yelp to find and learn more about your business. Very rarely will I ever come to a local business without doing at least a little bit of research online if I can. Your prospective customers are no different. They will continue to rely on what others say about your business to help them make a decision about whether or not to do business with you. The internet has enabled your prospects to much more easily use word of mouth to help them make decisions about your business. Indeed, after all, the internet is one of the most democratic mediums ever created. Anyone can have their say and information isn’t controlled by any single person or organization. That’s the beauty of the internet and why your prospective customers are comfortable relying on such information. Furthermore, your prospective customers are lazy . What makes the internet so appealing for word of mouth information is that it extremely convenient. All your customer has to do is open up his or her laptop or pull out his or her mobile phone. Moreover, the internet is increasingly making it even easier for you to tap your immediate social network for word of mouth recommendations and information. Facebook, Twitter, and the like are much more relevant to your prospective customer as word of mouth sources, because these sites contain individuals that your prospective customer has actually chosen to connect with (usually friends and family). Thus, thanks to the internet, now your prospects can better and more conveniently utilize their most trusted sources of information (i.e. their friends). Therefore, if there is anywhere word of mouth is taking off, it’s on the internet. Word of mouth can be like wildfire. Though you don’t have control of the winds that may move it from one direction to another, you can do things to help guide it. One thing you can do for starters is build a presence online. That means take ownership of your online listings, set up an account with Facebook and Twitter, build a website, etc. Without a presence, there’s absolutely no chance you can guide the conversation online. The next thing you can do is start your own conversation. Indeed, one thing that’s truly fantastic about the internet is that it can be one big megaphone for your business. By publishing your own content you give your customers a real look into your business. Such transparency and interaction can and will help you build valuable relationships with prospective customers. Lastly you can converse directly with your customers. This means listening to your customers online and responding to conversations your customers have about you on the web. There’s absolutely no reason to be shy, like anyone else, your customers will sincerely appreciate the fact that you are listening to them. Moreover, you may learn something too . See what you may already be doing to influence the online conversation about your business and start creating a “social media strategy” for your local business using these guidelines.